Rumpelstiltskin Revisited: No princes need apply. 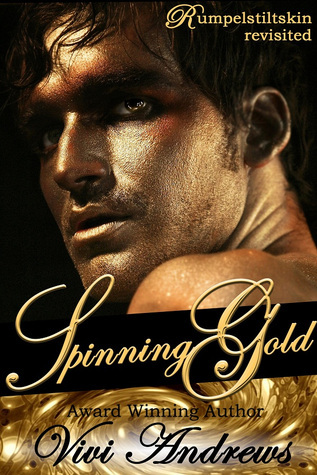 Forced by a tyrannical prince to spin straw into gold, Juliana finds an unlikely ally in a handsome gold-skinned man trapped inside her enchanted medallion. Drawn to him by a mystical connection, together they must find a way to escape the prince who demands they keep producing gold for him... or die. Juliana Ravel will do anything to save her innocent brother from the executioner, but what the supposedly charming prince demands is impossible. Spinning straw into gold? He might as well ask her to fly. Her only hope is a family heirloom - a gold medallion rumored to be the magic prison of one of the fabled golden fae. Trapped inside the medallion for hundreds of years, Rue isn't fool enough to trust Juliana, but he can’t help but be tempted by the feisty beauty. Even though she is the spitting image of the witch who betrayed and imprisoned him, Rue agrees to help her. For a price. Entranced by the exotic, golden-skinned man, Juliana agrees to his terms, believing her worries are at an end. But when the tyrannical prince finds her surrounded by riches, he isn’t about to let her walk away – instead holding her prisoner within the corrupt court. Juliana’s only freedom is her nights with Rue, where their negotiations turn to seduction, and together they construct a desperate plot to escape a life where they must keep spinning gold… or die. I absolutely adored this book! I have a thing for retellings - especially fairy tale retellings! This is a Rumpelstiltskin retelling. Rue, or Rumpelstiltskin, is trapped in his own medallion by a Ravel ancestor. Juliana finds herself in a desperate predicament - and unknowingly calls Rue from the medallion to help her. Rue is one of the golden fae, and can spin straw into gold. Sounds exactly like the story, right? There is a handsome prince who wants to marry Juliana, after the first night of the gold spinning. He wants to marry her for her gold-spinning abilities, though in truth, she has none. Juliana is trapped - and all she wanted to do in the first place was free her imprisoned brother. This book itself is really short, but the story takes place over several months. Juliana tells the prince that she can only spin straw into gold three times in her life, and all three must be separate nights of the full moon. So, three full moon passed in this book. Three times does Juliana meet Rue. At first, Rue absolutely loathes Juliana, because he thinks that she is the Ravel that trapped him in his medallion. But he quickly realizes that she is not, as she is much too nice for a Ravel. The two of the them fall in love, and by the third night of a full moon, they decide they can't be without each other. Unfortunately, by then, the prince has decided to marry Juliana. Yes, Ms. Andrews definitely turns up the steamy in this book. Rue is... yummy! I want my own golden man. Basically, I can tell you that this book was awesome - in the world-building, romance, characters, and plot. There IS a very cool plot! There is a revolution, which Juliana joins at the end, to overthrow the prince. But the ending is great! There wasn't much that I did not like! I kind of just wish that this book was longer. I knew it would be short when I started the book, but I wanted more interactions between Rue and Juliana. There were several, but I wanted more, you know? This would have been an AMAZING full-length novel! If you're looking for a short and sweet romance novel, then totally! It's a really creative retelling, and I have no regrets reading it! 4 stars. What a fabulous book! This does sound like something fun and different that I'd enjoy. Thanks for sharing! It's a cute and hilarious story - definitely worth the re-read as well. You're very welcome, Sophia! Awesome review Alyssa I love fairy tale retellings books as well there are my all time favorite! I never read a Rumpelstiltskin retelling before and this book looks and sounds amazing have to check this one out soon and I absolutely love the cover! thanks for sharing Alyssa!